Although it is supposed to be a useful tool to show you discounts, Coprofit is simply a region-specific adware application that may put your virtual security at risk. As a matter of fact, this malware targets Russian computer users, but it does not mean that it cannot show up on your computer. The reason is simple: This adware is spread in software bundles on the web; therefore anyone might download it from certain suspicious file-sharing websites. And if this infection has found its way to your computer, it is most likely that you have ended up on questionable freeware or torrent sites recently. Many users do not know how their computer gets infected with malware and they do not usually recall installing unwanted tools, let alone infections. But the sad truth is that it is the user who actually initiates the download and installation most of the time. You need to remove Coprofit if you do not want to be exposed to potentially dangerous web content. If you read on, we will tell you how you can prevent similar attacks from happening and how you can clean your computer from uninvited guests. 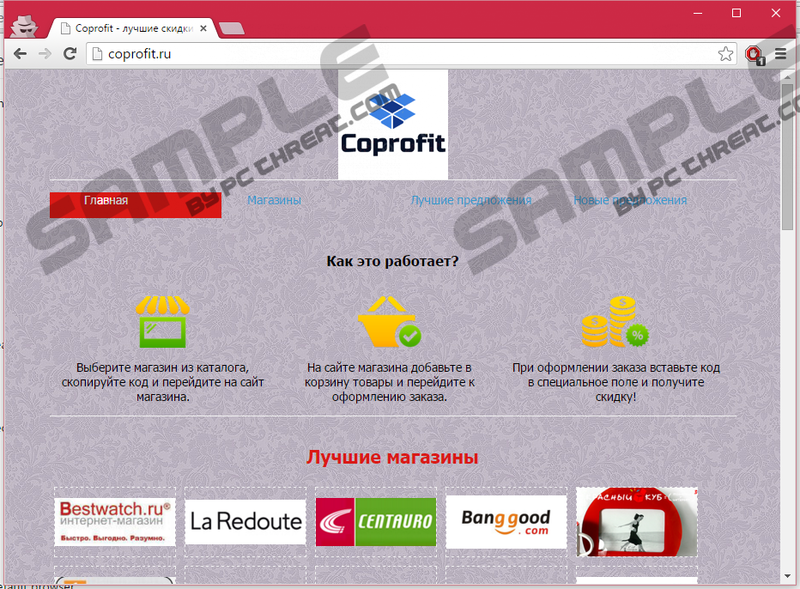 There is a website that seems to promote Coprofit, and you can find it at coprofit.ru, which clearly shows that this is a Russian infection. However, you cannot download this tool from the website. In fact, you only find a bunch of quick links to alleged websites where you can use coupons. Unfortunately, we have found that neither the website, nor this application has too much to do with discounts or legitimate coupons. Since this tool is not available for download from its promotional site, we can only infer that it is distributed in freeware bundles. This is the method schemers tend to use to spread their malicious programs all over the net. Such infected bundles are most commonly hosted on questionable freeware sites and other P2P websites. Since hundreds of thousands of computer users search the web every day to find newer and newer free software or tools to download, no wonder why more and more file-sharing websites emerge. We advise you to always make sure that the software you want to install is a reliable one in the first place. If you spend only one minute, for example, to Google Coprofit, guess what you will find. You do not even need to go to the second page of the results because you will find a number of articles and links on the first page about how or why you should remove Coprofit. That should tell you a lot about this tool; mostly, that its presence is undesirable on your computer to say the least. But let us see how this adware may cause security issues for your operating system. This application may start displaying potentially harmful third-party advertisements. That is a general problem with all ad-supported applications. We have found that Coprofit is an identical clone of Everysale, Likecoupon, and Couponriser. If you find any of these applications on your computer, you should delete them right away. Adware programs generate revenue for their creators by routing web traffic to affiliated websites. Therefore, you cannot expect this adware to show you legitimate discounts and coupons when it has a job to do, i.e., to promote certain third-party websites. However, these third parties can be anyone and you will never know which one you can trust. If you click on such an ad, you might land on unreliable websites where you might get scammed in all kinds of ways. As a matter of fact, the presence of this adware might also influence where you might end up when you click on legitimate-looking advertisements. You can be viewing, for example, YouTube or eBay, and see an ad that looks interesting to you. If you click on it and you land on a suspicious website, it could be a clear sign that your computer is infected with adware. In this case, you should delete Coprofit and run a system scan as well because these infections rarely come alone. In order to find this and other adware applications, browser hijackers, and potentially unwanted programs, first you should check the list of installed programs in Control Panel. Locate Coprofit and run its uninstaller. Check for other unfamiliar or suspicious programs there. If in doubt, you should always use a reliable search engine to find information about applications. Another way you can find these unwanted tools is to check the extension lists of your browsers. This adware also uses browser extensions in order to be able to display its third-party ads through the browsers. Fortunately, the uninstaller takes care of these. But it is still possible that you have other undesirable extensions you would be better off removing. Of course, the best solution for the protection of your PC is always a reliable antimalware application since you cannot manually find all the threats unless you are an IT expert and know where to look. Press the Start button and choose Control Panel. Quick & tested solution for Coprofit removal.